While flowers and herbs are the usual plants grown in containers, other vegetables can also thrive in a hanging pot. The vines of the pole bean need no support when grown in a hanging planter. Instead, the vines hang over the side of the planter instead of growing upward. You can easily harvest them and care for them in the planter. Growing healthy vegetables in hanging baskets requires some maintenance not required in a traditional garden bed, but it is very similar overall to basic container growing. Fill a hanging pot with potting mix to within 2 inches of the rim of the pot. Hang it in an area that receives at least 8 hours of sunlight but is protected from high winds, as these can blow the basket down. Sow bean seeds around the edge of the pot. Plant them 1 1/2 inches deep and space them 2 inches apart. Water immediately after planting until the excess moisture drains from the bottom of the hanging pot. Seeds typically germinate within 5-7 days after planting. Check the soil in the pot daily and water as soon as it begins to feel dry. Avoid getting water on the bean plants as this can lead to disease. Guide the plants over the edge of the pot as they grow, moving them gently with your hands. Beans will begin by growing upward and then the vines will begin to hang down once they find no support. Pinch the end of each vine once it has grown to within 6 inches of the ground. This stops further lengthening so the vines don't drag on the ground and open the plant up to disease. Harvest the beans once the pods are full-size but still tender and green. Harvest dried shelling beans once the pods are dry and the beans rattle inside. 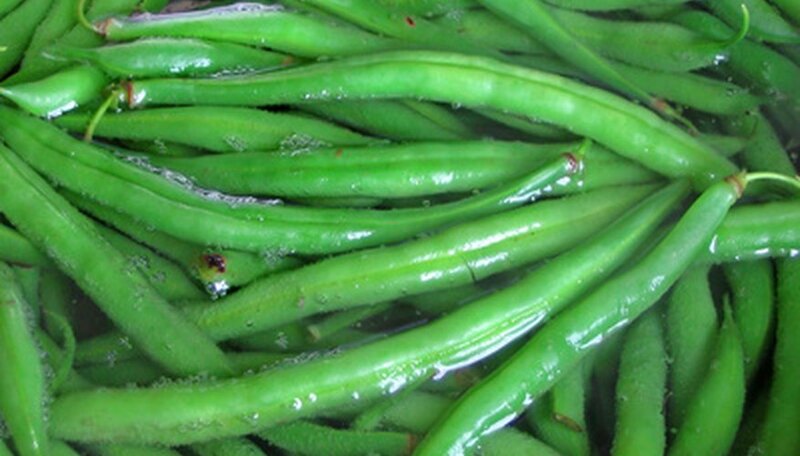 Frequent harvesting of green snap beans encourages further bean production on the plants. If your beans don't want to trail over the side of the hanging basket bury lengths of garden twine in the pot and have the excess twine hang over the side. The beans will then climb down the hanging twine lengths. Beans rarely require any additional fertilization as long as they are planted in a quality potting mix. Hanging pots dry out very quickly. Check the soil moisture frequently, especially during hot periods.